See below for info on this weekend's events on the Trails of History. Visit the May program page for additional information or to plan ahead for Memorial Day weekend. There were some great visuals shared this week by sites on the Trails of History. Here are just a few of them for your viewing pleasure. Who thinks about the history of paperclips? The Early Office Museum does. That’s where I found information about the ones Mary Jane found. 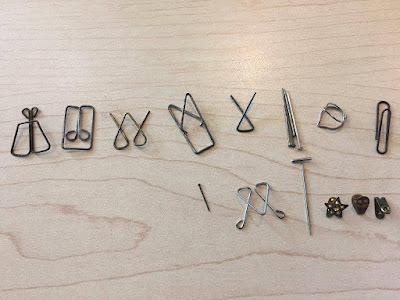 Left to Right Top Row: Mussian Paper Clip 1902; Owl 1905 to the present: Niagara clip patented 1897 and advertised until 1950; Standard Paper Clip advertised 1910-1941; Fay Paper Clip originally patented in 1867 and manufactured by many companies after 1896; straight pins; Rinklip patented 1903 and still made; Gem patented in 1903 still used. 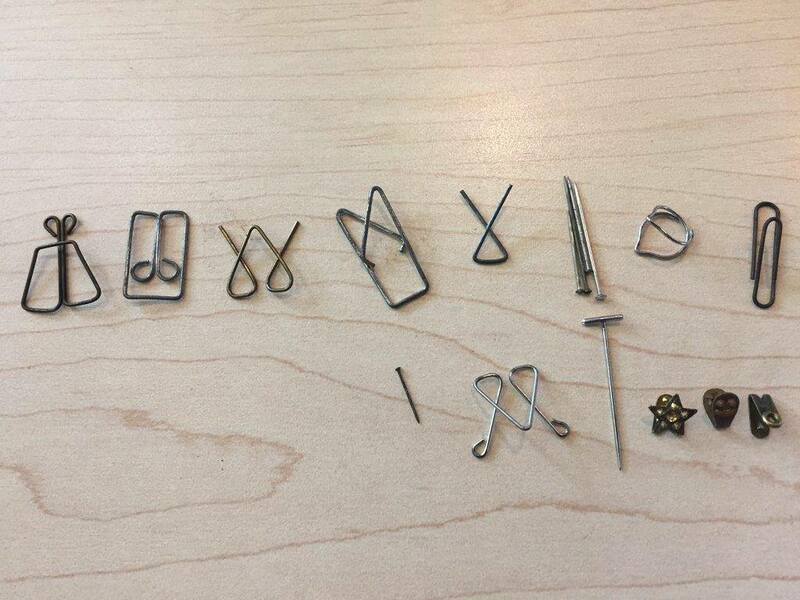 Bottom Row: little straight pin; Improved Niagara Paper Clip advertised 1908-1950; T-shaped pins were machine made for clothing by 1836 but were patented as paper clips in 1902. The rest are stamped out of sheet metal – star, smiley face and heart with no known maker – yet. Also this week, folks from Drake Well's Mobile Energy Education Training Unit (MEET-U) staffed a display booth at the Intel International Science and Engineering Fair in Pittsburgh. They promoted MEET-U programs, Drake Well, and the PHMC at this annual event that features nearly 2,000 high schoolers showcasing their inventions and independent research to approximately 11,000 attendees. Yesterday morning (Thursday, May 17) roughly 100 U.S. Army soldiers mustered on the grounds of the Pennsylvania Military Museum for PT (physical training). It's a little hard to see in the photo (I was afraid to crop too much of the scene), but the soldiers were running on the paths that circumnavigate the parade grounds. This Sunday, May 20, the grounds will be crowded with military equipment and personnel for the Pennsylvania National Guard's annual Celebration of Service. 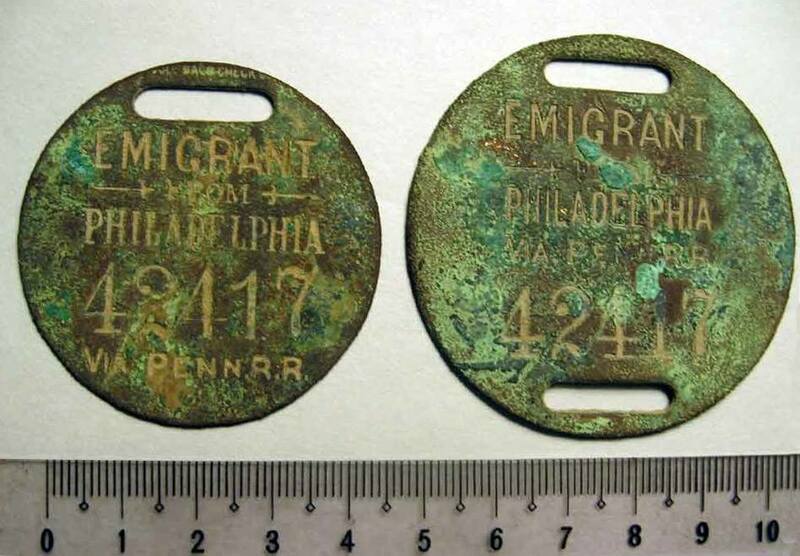 The Railroad Museum of Pennsylvania posted a photo on Facebook of two rare baggage tags. The museum's collections include thousands of fascinating objects with stories to tell. The story of the United States of America is one of migration of individuals, families and communities traveling to these shores and over this land, motivated by a quest for something better in life. 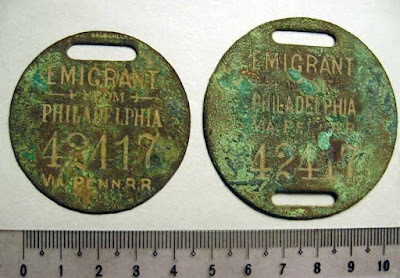 These emigrant baggage tags were discovered in the ground in western Pennsylvania and are a rare find of tags issued by the Pennsylvania Railroad in Philadelphia, and made by the Hoole Manufacturing Company of New York. Pennsbury Manor has introduced apiaries (bee hives) into the orchards (see video below from Facebook). Students attending the Pennsylvania Day school program in two weeks will get the first look at new bee-centered educational programs at the site. 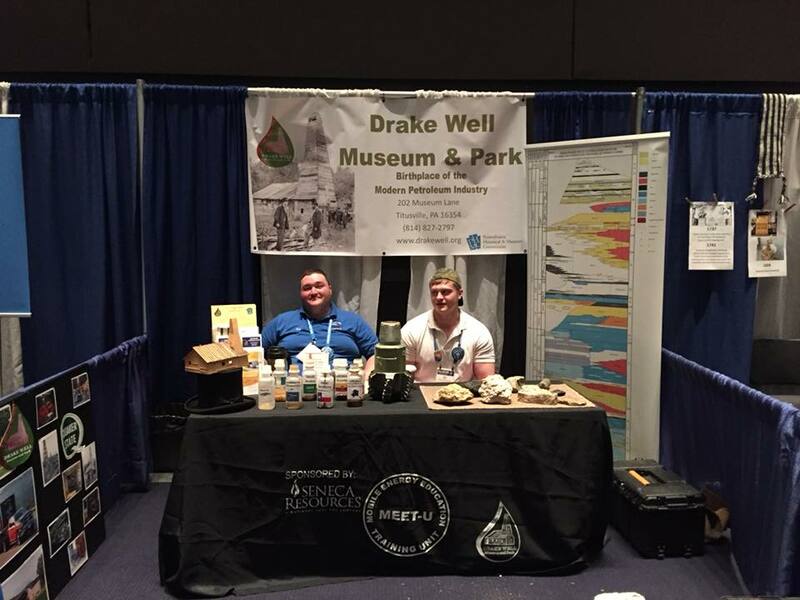 May 19: MEET-U in 5 & 1/—enjoy a 5-mile or 13-mile (half marathon) run through the grounds of Drake Well Museum and Oil Creek State Park and help the museum’s MEET-U educational outreach program. Registration is required; registration form is on the website. May 19: Colonial Beer Brewing Demo—Mike the brewer will be practicing his beer brewing skills for a larger living history program in October (Facebook event page). 9 am-2 pm (site open until 4). May 20: Site open—Hope Lodge is open for tours every Sunday through October. Admission is charged. 1-4 pm. May 20: Lecture—author Jay Paisley will discuss his book on the Civil War letters of William Henry Huffman. Light refreshments to follow. 2-4 pm. May 20: Sunday programming—today is "Open Hearth Cooking." Included in regular admission. 1-4 pm. May 20: 3rd Sunday Series—this month's program is a demonstration of traditional dutch oven cooking by John and Jan Halter (more info on Facebook event page). Museum is open 9 am-5 pm; program runs 1-3 pm. May 20: A Celebration of Service—US Army reunion and memorial service sponsored by the PA National Guard and held on the museum grounds. Museum is open 10 am-5 pm (ceremony begins at 12:30 pm, but military vehicles, helicopters, and equipment begin arriving earlier in the day). May 19: Frosty Mugs of Thunder Brewfest—enjoy beer tasting, food, live music, and historical demonstrations. Event is rain or shine, and you must be at least 21 to attend. Visit the Frosty Mugs of Thunder Facebook page for details on tickets (including designated driver tickets) and participating breweries/food vendors. 4-8 pm.